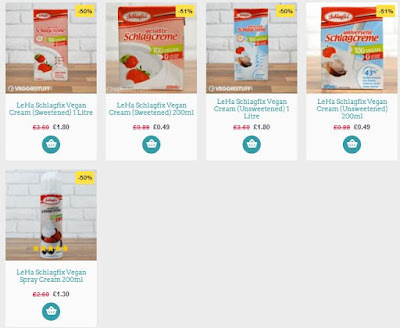 The Vegan Magpie: Veggiestuff Schlagfix Half Price Offer! Hello! I've got a pretty big deal to tell you about! For the next 21 days (So until the end of the month basically!) the popular webstore Veggie Stuff are offering half price on ALL Schlagfix creams! All of them! So this includes the spray cream, small whipping creams and large whipping creams. Just head here to see the range: Schlagfix creams See below to learn of my love for this product. There is postage to consider, which appears to range between £3.85-£5.99 depending on what's in your basket, however if you are planning to stock up I feel this is worth it. Schlagfix is the cream I recommend to everyone and am trying hard to get it into more store via Coffee and Cheese vegan distributors. I have tried Soyatoo and it just doesn't cut it for me. I use the spray can of Schlagfix on items such as hot chocolates, or fruit (with aquafaba meringues!) and I use the unsweetened whipping cream (and sweeten it myself) for things such as banoffee pies, trifles, scones with jam and cream. It's very versatile and for this price it's a bargain! Even with postage it's a good offer I think. I will say, if you have trouble with the spray cream, dip the can in hot water for a few minutes and it should spray nicely.